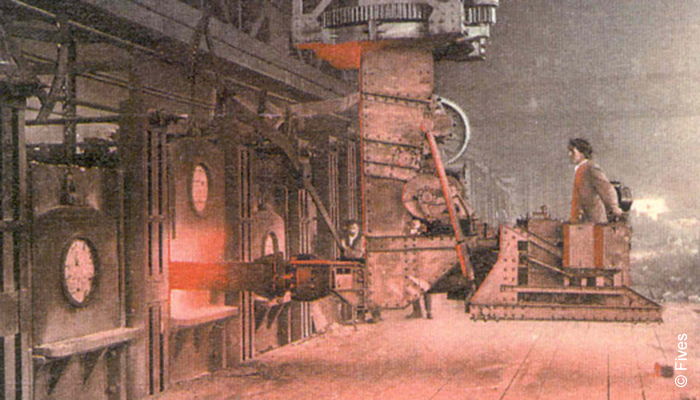 Fives’ activity in the steel industry dates back to 1867. Its history of innovation is marked by strategic acquisitions and exciting technological breakthroughs. Fives’ history is shaped by the acquisition of companies with long histories of their own. 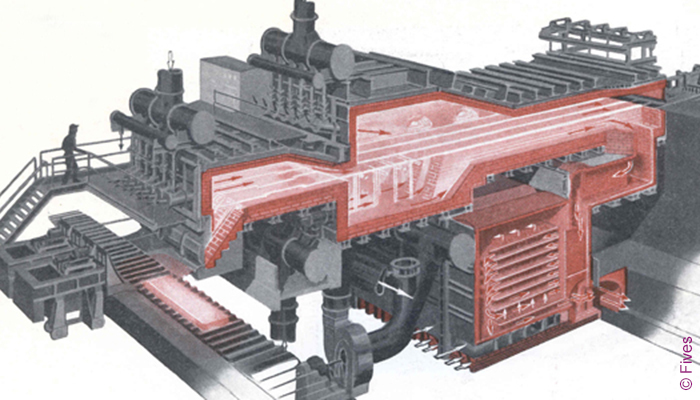 The origins of Fives’ activity in the steel industry can be traced back to 1867, with the founding of Dujardin near Lille in France, initially specializing in steam engines and then diesel engines and compressors. The story of how Fives’ activity in the steel industry grew to offer the expertise available today includes many other players. In France, Fichet-Heurtey, originated in 1872, began constructing reheating furnaces for steel and heat treatment furnaces in 1889. The company was later renamed Heurtey Metallurgie. 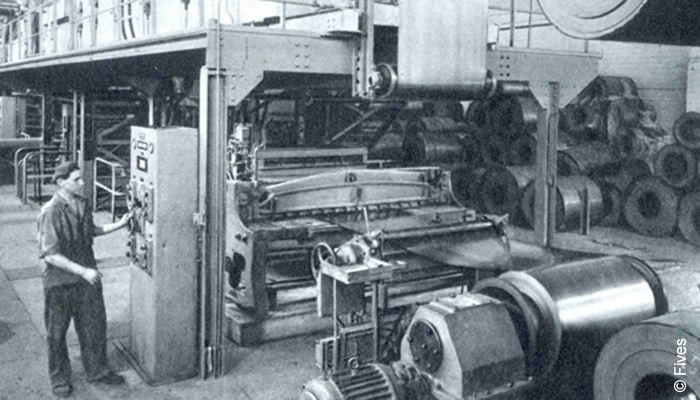 In 1896, Taylor-Wilson Company Ltd. began developing finishing equipment for the steel industry. Etna Machine Company was founded in 1901 and began manufacturing a unique brush-drilling machine, rotary swagers, tube forming and welding machines, and other similar machines for the tube industry. Charles Marie Stein & Cie, established in 1908, specialized in industrial heating and manufacturing of electrical and oil furnaces and was later renamed Stein Surface. 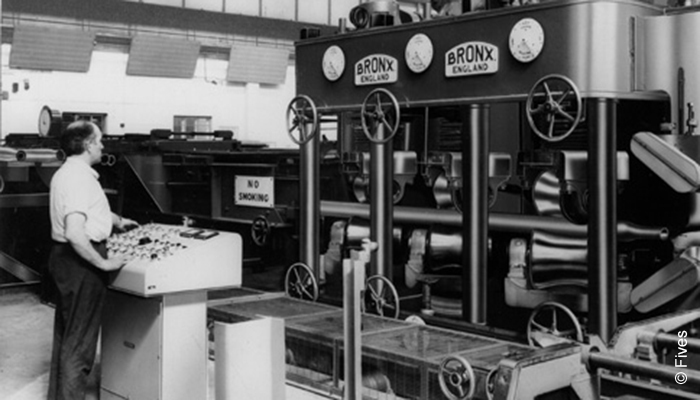 Bronx Engineering was established in the heart of industrial England in 1940. It began its work developing general equipment for the European steel industry, later becoming a pioneer and innovator, manufacturing straightening products for the production of tube, pipe, bar and profiles. Key mergers and acquisitions in the steelmaking industry form an important part of Fives’ heritage, beginning with the merger in 1972 of Dujardin, Montbard and Somenor to create DMS, a mechanical equipment designer and supplier. DMS was acquired by Fives (then Fives-Cail-Babcock (FCB)) in 1984. In 1980, Stein Surface merged with Heurtey Metallurgie and became Stein Heurtey, which was acquired by the Fives-Lille Group (formerly FCB) in 1987 and renamed Fives Stein in 2007. In 1988, Bronx and Taylor-Wilson merged to form Bronx Taylor-Wilson, a global leader in steel and non-ferrous mill finishing equipment. Abbey International (formerly Etna Machine Company) joined the team in 2003 and the partnership was acquired by Fives in 2010, becoming Fives Bronx. In 2013, Fives acquired metallurgical assistance specialist KEODS, and tube & pipe mill supplier OTO S.p.A.
Building the company through natural growth and strategic acquisitions has enabled Fives to develop a complete spectrum of technology and expertise to anticipate and meet the needs of a changing steel industry. Fives is an international industrial engineering group with a history dating back more than 200 years to 1812. By the middle of that century, the company had become one of the largest industrial groups in France, designing, manufacturing and supplying equipment to the sugar, locomotive and construction industries. Landmark achievements included the Alexander III Bridge in Paris, metal frames for Gare d’Orsay, now the famous Musée d’Orsay, and lifts for the Eiffel Tower. Over the past two centuries, Fives has expanded worldwide and added to its broad range of expertise through strategic acquisitions. Today it serves almost all of the major industrial manufacturing sectors around the world.